Your toddler is going to experience Christmas for real this year, probably for the first time. Give them something good so they'll get a good feeling about Christmas in future. I've selected toddler toys, books and other gifts that are ready to be drooled on, chewed on etc. Toys, dolls, books and plush for your little ones. Whether they're not even a year old yet, 18 months or a tad bit older even. Are you in need of some gift ideas for Toddler Christmas gifts that are under $10? You might be fearful that you won't be able to find something that is fun for the child to play with, addresses developmental skills and does not cost an arm and a leg to purchase. Actually there are several wonderful toddler gifts that fall below that $10 mark that are educational along with being something that a child will enjoy during playtime. You can find toys and games that help with cognitive learning like memory, attention span and reasoning that don't hint to the child that while playing they are learning, too. Toddlers are in an almost constant state of learning and developing. 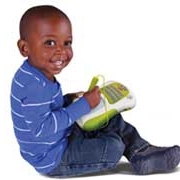 Selecting gifts that help them with eye/hand and eye/foot coordination along with simple things like being able to point to a picture or identify a shape are all gifts that will help them learn while they play and experiment. Many items can accomplish this and cost less than a $10 bill. Matching games are IT for kids this age. They'll beat you at it in no time and never get tired of it. A really great gift idea for a toddler is colorful shape blocks like the one below. At first they will learn to be able to make their little fingers and hands grasp a block. Eventually they begin to learn the color names and the shapes of the pieces. Later they begin to problem solve by figuring out how to get the round block into the round hole. They also begin to deduct that some things do not work such as the square block will never be able to go into the round or triangle hole. Includes five shapes for learning identification in five different colors. There are 10 blocks included that can be easily stored in the container when children are not playing with the blocks. Recommended for children from 6 month to 8 years of age. A popular playtime activity is to play with modeling compounds like Play-Doh. Toddlers can learn to work the pliable compound with their hands. Rolling it, smashing it and eventually creating little masterpieces with the "dough". Also a hidden way to teach colors and shapes while exercising their little fingers and hands developing strength. It also gets them in touch with their creative side. You can use all sorts of things that you have around the house to play with the modeling compound. A favorite in our house is cookie cutters that we purchased specifically for playtime. 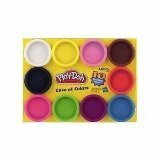 A basic set includes 10 colors of play-doh each in an individual 2 ounce container. Recommended for ages 2 to 5 years. Smaller children should be supervised while playing so that they do not try to eat the modeling compound. It does not matter which gender of toddler you are buying for, kids love to play with a ball. There is so much that you can do with a simple ball. Children first learn to pick it up. They learn to roll the ball, kick the ball, bounce the ball and toss the ball. It can be played with indoors or outdoors. Kids find so many ways to play with a ball which encourages imagination and creativity. 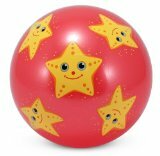 This ball is a generous 8.5 inches in diameter and has a cute five point star decoration incorporated in the design. Perfect for a boy or girl and should provide many a fun playtime activity. Playtime and developing time go together in a toddlers life. Pretty much everything is looked at as play with children. It is important that the items that we provide for them to play with include and encourage ways to work on their fine motor skills. Children figure out some of the basic skills on their own like walking, running and jumping. It is the finer skills that can be added to playing that will help them the most. It doesn't take much for a young toddler to figure out how to pick a toy up and empty it of its contents. Helping them learn how to place items into the container takes more practice. Kids learn quickly how to knock down a tower or stacked items. It takes them a little longer to figure out how to stack items precisely so that they do not fall on their own. Giving gifts of toys that will encourage the different skill sets provide entertainment and fun for the child but also help them with getting ready for going to school. Many of the activities of a toddler teach them skills that they will use for the rest of their lives. Items from the 123 line fit well together to make for even more options for pretend play. For instance you can check out the motor bike, zoo, Noah's ark, truck with garage etc. Each set comes in the same vibrant child friendly colors and is designed for toddlers over 18 months up to 36 months old. Combine these for an even richer fantasy play world for your toddler. What toddler doesn't like to pretend to fly? This set is ready for fantasy plane flying for your budding pilot. I never know why dad isn't included in such sets, but still: nice for the girl who wants to play mom. This biblical themed set contains a large amount of animals that can be played with in all kinds of story-lines, including Noah's Ark of course. Pretend play is not only fun for children but it also helps in a variety of development skills, too. Puzzles can play a part in that play. They can pretend to talk to the animals in the puzzle or pretend to be at the place represented in the picture. They learn to problem solve by being able to recognize the piece that will go into the indented shape of the puzzle. If the pieces are animals they can learn the names of the animals and what sound they make. They learn spatial lessons by figuring out that the horse, for example, does not fit when it is upside down but if they turn it around it will fit. Their dexterity begins to develop as they learn to pick up the individual pieces and then place them in the correct place. Melissa and Doug is one of the most popular manufacturers of wooden toys. They make wooden puzzles, cutting fruit and vegetables, wooden dolls, wooden castles, wooden doll houses, plus a zillion other toys. They have chunky puzzles, peg puzzles, stringing beads, easy jigsaw puzzles, and wooden shape sorters for the toddler set. 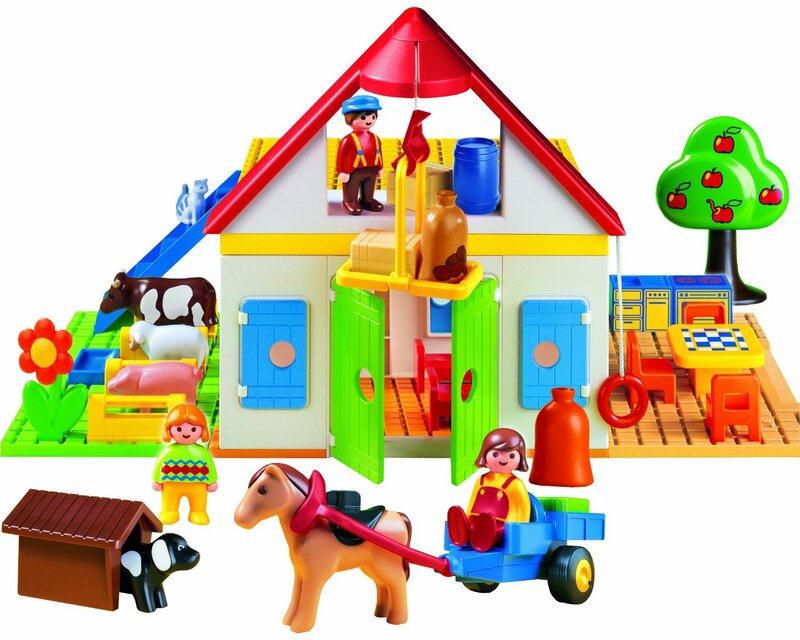 This puzzle offers the ability for the animals to stand on their own for additional play. Small hands can handle the pieces to the puzzle because they are extra thick. There are colorful images in the slots for the pieces to fit in, too. Recommended for ages 2 years and older. His eyes, eyebrow, "ears" and mouth move to create different expressions and dialogue for pretend play. Exploring their world is what toddlers do... These Nest & Stack Buckets help them do that, without costing you a fortune... It will help them develop hand-eye coordination. This is the sort of toy developmental psychologists get their children, for instance the Kidoozie Stack 'n Sort. The teething gel many parents use can cause severe health issues. It's therefore best to stick to the old fashioned solution: teething toys in combination with massaging the gums. Sophie the Giraffe is one of the most popular teething toys right now. Isn't she cute? 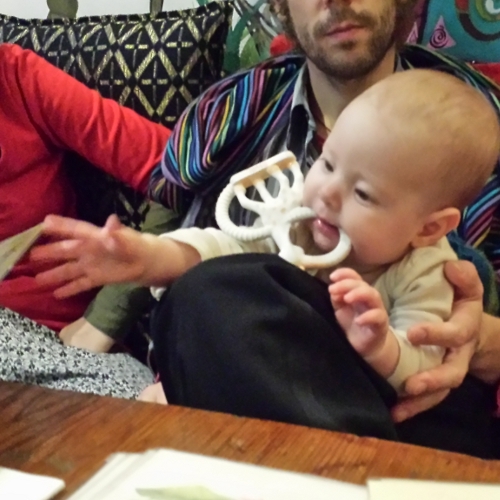 From a baby's perspective what distinguishes Sophie from other teething toys is that baby can hold her and move her from hand to hand and so on. She's easy to grab, easy to move around, harder to loose sight of than most other teething toys out there. Interactive toy that will help your toddler learn their letters - it has uniformly positive reviews from parents. This isn't just a walker: your baby can play with it lying on the floor: only when she's learning to walk does it need to become a walker too. A mom reports that her daughter loves this walker because of the interactive features. She will take off the front 'face' and play with it on the floor. She will also push it around and while she hasn't figured out how to use it as a walker yet, she's having fun learning to manipulate it. The other two walkers in their house are just not as interesting to her. Very good for all kids, including special needs kids (ADHD, Autism Spectrum etc). 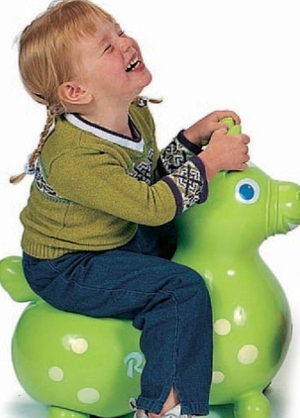 This is a fun dog that kids and teens can sit on, play with and generally have a good time on. As something to sit on it will help keep your most fidgety child sit reasonably still as they watch TV - perfect for their sensory motor integration (aka - will help them become more balanced), and they won't even notice that they're doing anything good for themselves. One parent says: It's more fun for my kids than just jumping on a regular ball hopper. Set to be THE most popular gift for any Sesame Street fan this season. Elmo plays various instruments and of course you child can sing along to every song he plays. A fun toy zoo with a few animals (you can buy more as extras) that will say the name of the animal and the sound it makes when you put it in the pen. Your toddler will love playing around with the animals and their zoo - no batteries needed for that part, though of course the talking zoo part DOES require some maintenance. Giving a gift of a small plush toy is always fun and they do not have to take a huge bite out of your budget. There are a variety of different animals to choose from which can resemble a pet in your home like a cat or dog. Although there are some fun wild animals to choose from, too. The great thing about a plush toy is that children can cuddle them as much as they want. Learning to be gentle and even to hug can be accomplished with a toy. 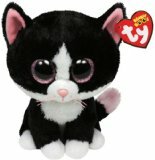 The Beanie Boos are about 6 1/2 inches tall and come in a variety of animal styles. Recommended for ages 3 years and up.